The fabric warehouse near our house has an assortment of zippers, but it can be tricky digging through the bins to find a zipper of the appropriate type, length, and colour. They also sell zippers by the yard, and will thread on as many pulls as you ask for. I picked up a few yards of zipper tape months ago as an experiment. I’ve used the zippers on a number of small pouches already. It’s so convenient being able to just cut the length of the zipper I need instead of sifting through a stash of pre-cut zippers. Today I was sewing a large pouch that needed a 21″ zipper along one end. One side of the zipper had escaped the zipper pull on the segment I was working with, so I opened the zipper and removed the last two zipper pulls that were on it. Then I realized I had no idea how to get the zipper pulls back on. After a little bit of wiggling, I got the zipper pull onto the coils. The new zipper pull zipped the zipper closed behind it. Hooray! Bonus: Because I had left the bottom part of the zipper closed, by the time I had moved the zipper pull to the middle of the segment I had stitched into the pouch, the zipper pull was basically in between two closed parts of the zipper. This made stitching over both sides of the zipper much neater than it would have been if one of the sides were open, like the way pre-cut zippers are. I love how easy it is to find all sorts of practical tutorials on the Internet. It’s a small thing, but it’s nice to know that I can deal with zipper pulls and zipper tape. 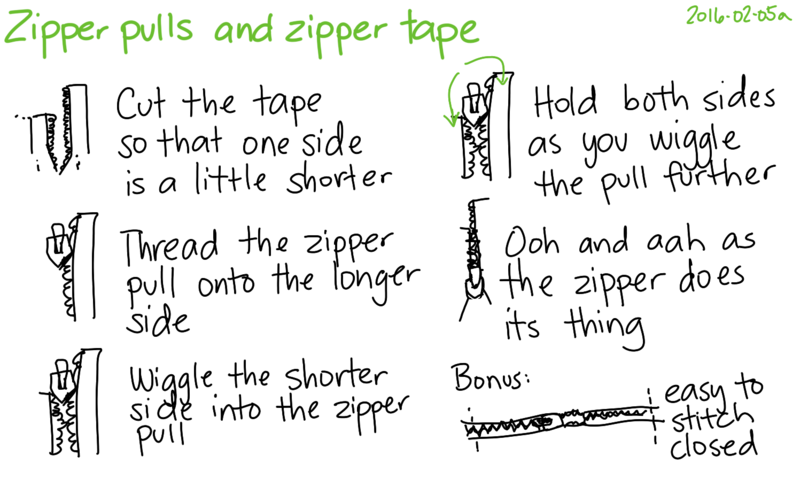 It means that I can buy zipper tape by the yard and never have to worry about having the wrong length, and that I can make large containers without being constrained by the pre-cut lengths available in the fabric stores. Yay making things! 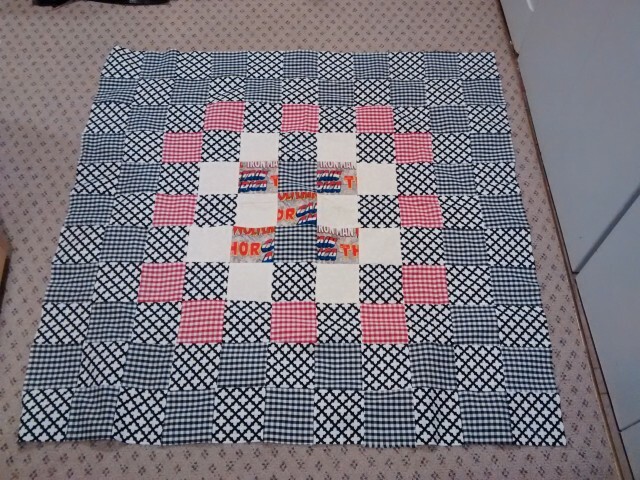 I’ve been looking into patchwork and quilting as a way to reuse scraps of fabric left over from sewing. That way, I don’t end up stashing stray odd-cuts forever, and I don’t feel guilty about trashing or donating material. (There are only so many zippered pouches I need in my life!) I can cut as many standard-size pieces as I can, and then store those in a more organized way. I counted the squares I cut from some fabric I had lying around, and assigned one-character labels for them. I stopped after I cut a little over 121 squares (11×11). … I found this code to be really helpful for making sure I hadn’t put in more of one character than I had, and to show me which ones I still had left. The first column has the number of squares used in the design. The second column has the number of squares left. The remaining columns were copied from the original table. 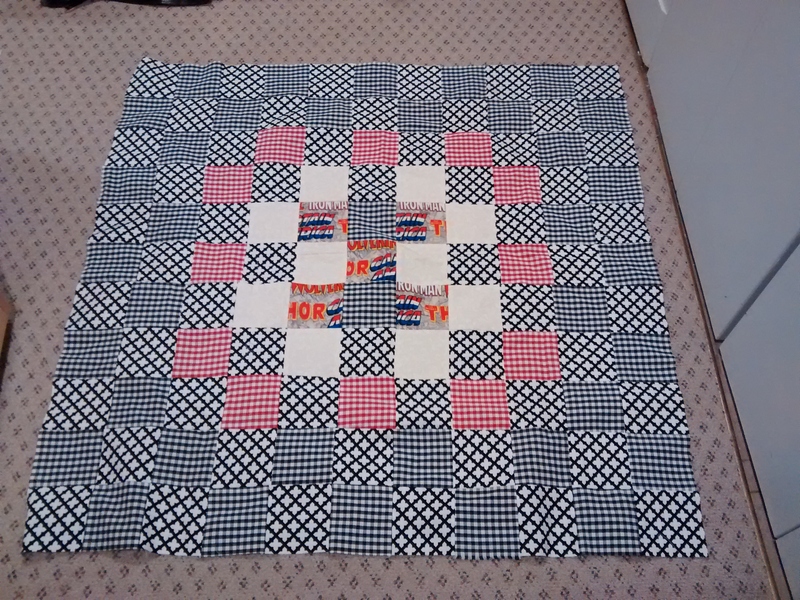 After lots of sewing and pressing, I ended up with something that looked reasonably like a patchwork quilt. It was actually pretty relaxing to sew once I got the hang of arranging things, since it just used straight lines. I unpicked two seams after stitching them incorrectly. The rest of the seams turned out okay. In retrospect, maybe I shouldn’t have included two strong black-and-white prints. This one feels a little like an optical illusion, and it’s not that restful to look at it in full. I probably won’t be using it as a wall hanging, but it might be nice to use it to dress up one of the cat beds. I could skip the batting, buy a cotton or flannel sheet from the thrift store for use as backing, and then quilt it for practice. Skipping the batting this time around might let me get away without setting up a walking foot, too. I still have tons to learn about dealing with colours and prints. Maybe I can learn faster with smaller blocks. I’ll probably cut more 4″ squares since that’s a convenient size for my grid ruler, and maybe 2.5″ or 2″ if there are leftover scraps that won’t fit. Then I’ll organize them by value and colour and see what I can make. I can turn them into shopping bags, since our current collection is starting to wear out. We’ll see how that goes! I’ve been thinking about what’s worth making and what’s worth buying. Sometimes it’s cheaper to buy finished products used (or even new) than to buy the raw materials to make my own, especially in terms of common clothes and accessories. On the other hand, there are benefits to using and developing my DIY skills, such as cooking and sewing (and maybe eventually woodworking again). Thinking about my considerations for that make vs. buy decision can help me improve those decisions. If I can make that “make” decision better, I can benefit from improved skills, more satisfaction, and possible savings. If I can make that “buy” decision better, I can take advantage of the capabilities of industries. Here are some factors that nudge me towards making things instead of buying them. When something is much more expensive to buy than to make: Considering the quantities I use, the characteristics I want, and the cost of raw materials and time, it can be much cheaper to make things than to buy them. Cooking generally falls into this category. Sometimes sewing does too, especially if I can use fabric from sales or the thrift store. When I want to adjust for personal fit, taste, or needs: It’s been nice to enjoy our favourite meals without being limited to what’s offered in restaurants. I also like being able to make several copies of simple blouses that fit me well in colours and fabrics that appeal to me, instead of trawling through stores to find the intersections of fit, style, fabric, colour/pattern, and price. For that extra bit of satisfaction: I feel a little more satisfied when I enjoy something I’ve made compared to something I’ve simply bought. I’ve noticed this with the clothes I wear and the meals I make, and I’m looking forward to enjoying this even more as I learn how to make accessories. When something is difficult to find: It’s often hard to find the things I want in store. Sometimes even online searching can be a hassle, especially with international shipping. Independence from market trends and frustrating shopping experiences: Along those lines, it’s nice to be able to skip noisy malls and arbitrary trends. Conversation starters and identity signallers: There’s a less of this because I don’t usually pay extra for novelty prints (well, aside from that Marvel comics one! =) ). I don’t feel the need to wear my geekiness on my sleeve – it usually comes out pretty quickly in conversation anyway. Still, it’s fun to infuse a little bit of personality into the things I make, like adding a cat-shaped pocket to a peasant blouse or making things that match each other. Who knows, maybe it will lead to interesting conversations with other crafters. Convenience, not having to search: A well-stocked pantry lets us make something we like without having to look for a restaurant that’s open with the kind of food we might want to eat at the moment. Likewise, I want to eventually develop an organized stash of flexible, easy-to-coordinate fabric so that I can make things as needed (ex: apparel cotton, flannel, lining, knit, PUL). I haven’t quite sorted out my system yet, and I tend to do things in single colours/patterns because I’m not confident about coordinating. Someday, though! Developing skills and appreciation: The more I make things, the more I learn about how things are constructed. This helps me appreciate the things around me, and it might even help me make those buying decisions more effectively. Fuel for thinking/writing/sharing: Experiments in making things can often be turned into blog posts and ideas. Ethical considerations: Although manufacturing can be good for the economic growth of developing countries, I’m not too comfortable with ethical issues in factories for clothing or other consumer goods. Besides, I like the waste reduction of repurposing things that might otherwise be trashed or turned into rags. The intrinsic enjoyment of the activity: Cooking is fun, especially when W- and I cook together. Sewing is starting to be pretty fun too. It has its frustrating moments, but I’m starting to build up a good stash of “Look! This actually works!” memories. There are things I definitely don’t have the skills or materials to make, so that’s an easy “buy” decision. If I could make it, but it’s much cheaper and easier to buy things, then I might put off making them. I tend to put off buying things if I know I can buy them inexpensively on short notice. I’ll wait until I have a clear need for them, since it’s often better to make do than to have more than we need. I’ll buy in advance if I have a clear idea of our usage, or if there’s a good enough sale that I’m comfortable with the trade-offs. Based on our enjoyment of DIY videos on YouTube, I think I’ll enjoy a life that’s tilted even more towards making things. It would be awesome to be able to think spatially and draft my own patterns, and maybe get more into laser cutting, 3D-printing, and woodworking too. We’ll see how things go! I sketched basic patterns for cylindrical and box-type containers the other day, so I wanted to try them out. It turned out that the Python framework I used for sewing patterns didn’t yet support arcs. Adding the arc element to the SVG was straightforward. I initially faked the bounding box for the arc, but since that made the code misbehave a little, I looked around for a better implementation. I translated the code from this post from 2011 to Python and added it to the code (git commit). That allowed me to make a simple cylinder pattern generator. I haven’t tested it yet, but it looks reasonable. The box tote was interesting to work on. When I did the math, I couldn’t believe that the calculations were that simple. I was waiting for a sqrt or a cos to show up, I think. 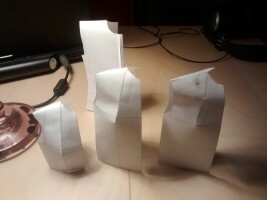 Still, the small-scale paper version I taped up looks like it makes sense, and I’ll sew a full-size version soon. J- asked for a light blue lunch bag that would fit our standard containers, and I’ve been meaning to make a casserole carrier for a while now. It would be handy to be able to make bags that are the right size. Too small and things don’t lie flat, too big and they move around too much. I spent most of my time making a flexible circle skirt pattern, pretzeling my brain around circumferences, angles, multiple pieces, and fullness multipliers. I’m happy with the way it turned out. It can generate patterns for quarter-circle skirts, half-circle skirts, full-circle skirts – even an arbitrary fraction of skirt fullness split into an arbitrary number of pieces, with optional seam allowance, waist seam allowance, and hem allowance. If you give it the fabric width, it will split the pattern into however many pieces are needed. If you specify a seam allowance and you want a full-circle skirt in a single piece (maybe for dolls), it’ll leave room for the seam allowances by adjusting the inner radius. We’re heading into snow pants season, so I probably won’t get around to testing it in fabric for a while. Caveat netrix, I guess. There’s supposed to be a -p command to output Postscript ready for printing, but command-line printing on Windows doesn’t seem to be as much of a thing as it is on Linux. Something to figure out another time, maybe. Anyway, now that I have a conversion pipeline, I can write a Bash script or Emacs Lisp to process things automatically. I’ll probably move from all this theoretical script-writing to more hands-on sewing during the rest of the week. My fabric order has arrived, so I’ve got a bit of cutting and sewing ahead of me. Hmm. With the command-line measurement and scaling overrides, it might be interesting to use this framework for papercraft and laser-cutting too. Someday! I’ve been playing with the tmtp project for programmatically generating SVGs based on body measurements in order to create basic blocks and sewing patterns (see my previous blog post). I’m not yet at the point of being able to look at an image and see if it will sew correctly. However, printing and taping up large patterns is frustrating and a waste of paper. Scaling the patterns down so that they fit on a single page of paper makes perfect sense. With the measurements I’m working with, a scale of 0.2 (1″ : 5″) makes things fit neatly on 8.5″x11″ paper. 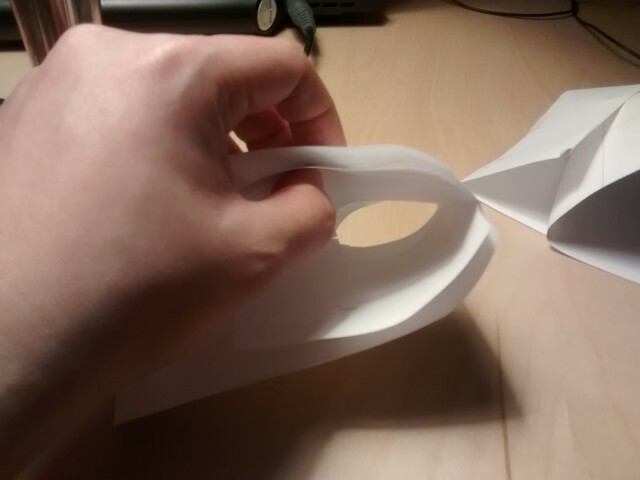 It’s easy enough to cut them out and tape them up into something that resembles the form. I generated a bunch of SVGs using my measurements, printed and cut them, and taped them up. Tada! They look like they make sense. 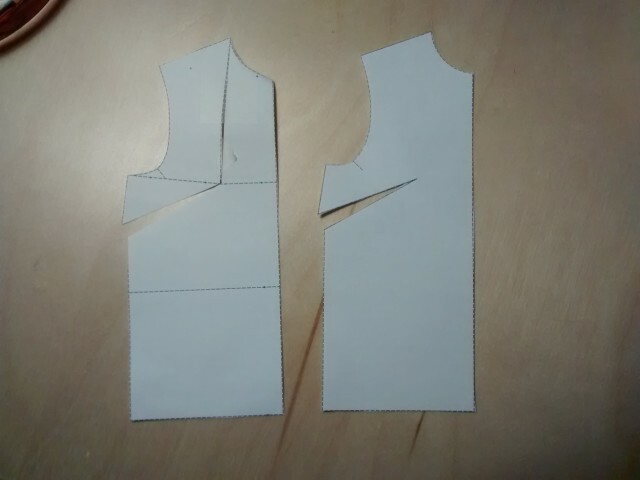 The easy-fitting bodice block from Metric Pattern Cutting is, as expected, looser than the close-fitting bodice block, and both are a little bit bigger than the basic bodice block from BurdaStyle. 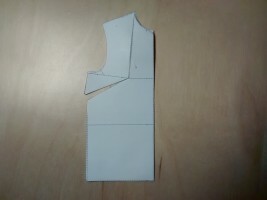 The basic shirt pattern from Cal Patch’s Design-it-Yourself Clothes fits over the basic blocks, as expected. It looks a little boxy compared to the blocks, but it will probably be fine in cotton, since cotton won’t be as stiff as paper. If I end up doing this a lot, I’ll probably look into modifying the patterns to draw an outline on a separate layer. Then I can convert the SVG for use with Hacklab’s laser cutter (see my previous experiments and fun results), so I can easily test with paper or fabric. 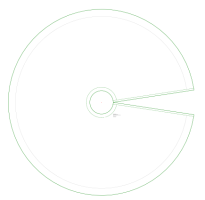 I added a few library functions, so now the code to rotate a dart is pretty short. It takes an array defining the dart points (start, apex, end), and another array of the points to rotate around the apex by the calculated angle. When I printed out my test pattern and cut it, the new pattern matched the result of slashing and spreading the dart on the previous bodice. 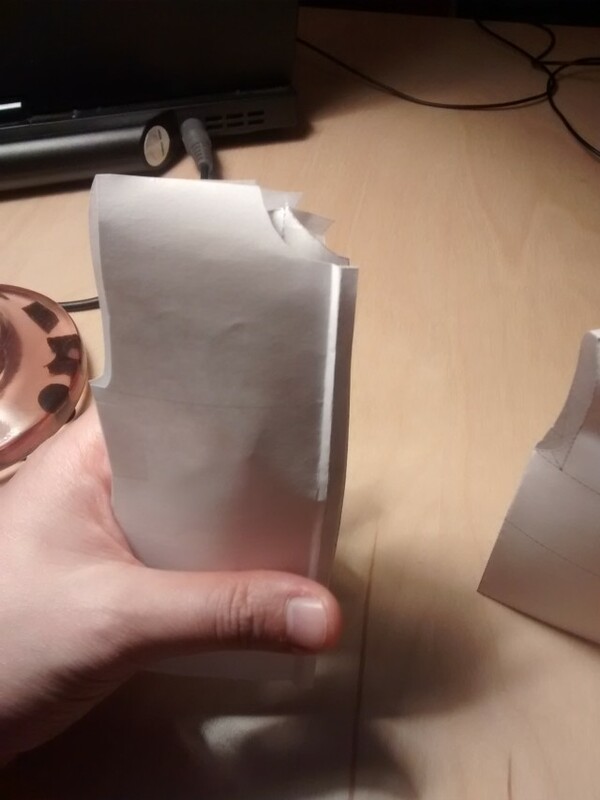 Hooray for paper testing! The next step would probably be to make an SVG slicer that converts large patterns into segments that can be printed on a home printer. It would probably move/clip the image, add cutting lines and labels for convenience, and export a series of SVGs. If I’m lucky, I might be able to find a Python library that will let me easily create a multi-page PDF. Anyway, now that I’ve got a simple way to test things on a small scale and a bit more of a handle on the math, I’m looking forward to playing around with generating actual patterns instead of just basic blocks. Whee! I’ve been raiding the thrift store for 100% cotton sheets with patterns or textures that appeal to me. After a trip through the washing machine and dryer, they’re ready to be turned into other things. It’s easier to imagine what they’ll wear like with the softness of well-washed cotton instead of the stiffness of fabric on the bolt. There’s so much fabric that it’s easy to take risks on sewing experiments without feeling like I need to worry too much about maximizing yardage or avoiding mistakes. At the moment, I’d rather buy fabric than finished clothes, if I think I can sew what I want. Every piece is an opportunity to learn something. Value Village is a bit higher-priced than the other thrift stores, but it has the advantage of being the largest one within walking distance. The price differences aren’t large enough to justify going on the subway. My limiting factor for sewing certainly isn’t a lack of fabric in my stash! It took me a while to realize that I could get lots of material from the thrift store instead of from the fabric store. When I started getting back into sewing last year, I sewed the same pattern in different solid-coloured fabrics, and then moved on to some of the patterns that I liked: gingham, floral, and even a Marvel Comics print. (Mwahaha!) The more I browsed through the selection at fabric stores, though, the more I felt that I didn’t need to find a specific print or colour in order to make something I would like. If I happened across something I liked at the thrift store, I could add it to my stash. If not, it was a good walk anyway, and there’s still more to sew beyond that. I suppose it’s a little like how we plan our groceries around the weekly flyers. If diced tomatoes are on sale, then it’s a good time to stock up. If not, we can cook from storage. If we’re out, there are plenty of other things we can cook. I’m now reasonably confident that I can turn fabric into something simple that I can comfortably wear, and that I might prefer wearing more that something I could buy either used or new. I’m also happy with the kind of fabric that I can easily get, with the occasional splurge or special order here and there. I could spend more – there’s room in my budget, considering it’s part utility, part entertainment, and part education – but I don’t need to, and I like not needing more.